Travelers from certain countries can now apply for a visa online before their trip to Zimbabwe. The e-Visa application platform enables foreign nationals to apply for their Zimbabwe visa 100% online. This saves traveler’s time, and it can be obtained easily from anywhere in the world. The e-Visa will be issued and paid for by the applicant online. Applicants will receive an e-mail confirming that their e-Visa application form was submitted successfully. We suggest you print out a copy of the document and keep it with your passport. You will need to show this document upon boarding your flight and again at immigration upon entry in Zimbabwe. The e-Visa is valid for 90 days from the date of issue. Zimbabwe e-Visas take up to 5 business days (Monday to Friday) to be issued. You need to apply for your e-Visa at least 3 weeks before your travel date. What is the Zimbabwe e-Visa? The Zimbabwe e-Visa enables foreign nationals to apply for their Zimbabwe visa online, eliminating the need to send your passport to an embassy. It is required if you wish to enter Zimbabwe. 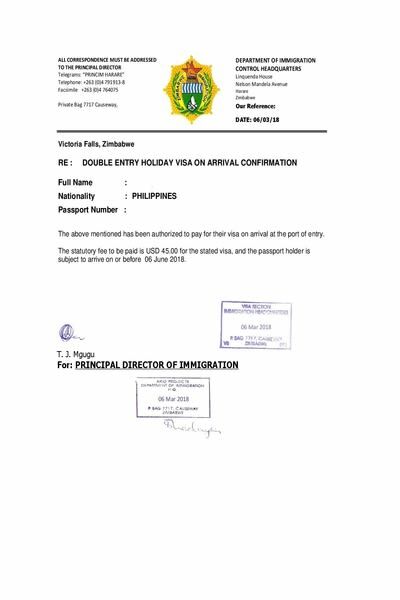 This visa will be sent to you via email, and you simply have to print this document out and present it upon entry to Zimbabwe. What do I need to apply for a Zimbabwe e-Visa? How much does a Zimbabwe e-Visa cost? The Zimbabwe e-Visa costs 30 USD for a single entry e-Visa and 45 USD for a double entry e-Visa. Additionally, there is a service fee of 25 USD for standard processing. For rush processing and super rush processing the service fee is 65 USD and 85 USD, respectively. How long does it take to get my Zimbabwe e-Visa? Rush Processing: 05 business days. Super Rush Processing: 03 business days. The Zimbabwe e-Visa is valid for a period of 90 days from the date of issue. This means you must enter Zimbabwe within 90 days. There is a single entry and double entry e-Visa. They allow a maximum stay of 90 days. What conditions must the applicant’s passport meet for the Zimbabwe e-Visa? Applicant’s passport should have at least 6-months validity from the time of entry into Zimbabwe and at least one blank page. The maximum stay allowed is 90 days for both the single and double entry e-Visas. With the double entry e-Visa, although it allows you 2 entries, the combined stay for your 2 visits cannot exceed 90 days. No. While the validity period of your e-Visa begins on the planned date of arrival, as indicated on your application, you are only required to enter Zimbabwe before the expiration date. You can actually stay in Zimbabwe even after the e-Visa expiration (assuming you still meet the 90 days maximum stay requirement) because the validity only refers to entry into Zimbabwe. How long before my trip to Zimbabwe should I apply? We recommend all travelers apply at least 3 weeks before their arrival, in case of unforeseen delays. Surely you have heard of Zimbabwe in the news, at least. It is the country whose inflation went so high that an egg ended up costing 50 billion Zimbabwean dollars. Nevertheless, it has been a while since that happened, and things to be a lot better now. Tourism flourished in the recent years, which is why many travelers choose it as a destination for their vacation. It is, after all, a beautiful country with wonderful wildlife. But before you go there, you should read a little about Zimbabwe so that you know what is what. You do not want any surprises in your journey, and you wish your trip to be as pleasant as possible. With that in mind, here is what you need to know before your trip. First of all, most people’s journey starts with Victoria Falls. It is a significantly large waterfall, and its positioning makes it look stunning. There is a hotel right beside it, where you can get accommodation and eat. The restaurant, however, may surprise you. Yes, you can eat western food and all that, but the prices are a bit exaggerated. Supposedly, the owners think that they are giving you the lovely opportunity to eat while seeing the mist of Victoria Falls, and while that is true, $50 is a bit much for a bowl of pasta, don’t you think? When it comes to communication, getting around should be pretty easy. People speak English in Zimbabwe, quite good, actually, so you should have no issues. If you want to make an effort and impress your guide/s, you should learn some common expressions in Shona. Shona is not the only language spoken in Zimbabwe, but it is one of the most common. A lot of tourists do not bother because they have English, but it would be a nice thing for you to do. Plus, you get to learn greetings in a foreign language. There is nothing bad about that. One of the things you want to do in Zimbabwe is to go and see the rhinos. Maybe you are already aware, but they are going extinct pretty fast, and we have all seen those rhinos guarded by the military with an AK-47 in their hands. Zimbabwe gives you the chance to see both black and white rhinos, which is one in a lifetime opportunity. Who knows? Maybe your children will not have this chance. With that being said, you should take advantage. It is an amazing experience, and you will have a lot of fun. Just make sure that you listen to your tour guide all the way there and back. Rhinos are usually peaceful creatures, but nobody wants to step on their toes. Their horns are really deadly. Apart from the rhinos, you can see a lot of other wild animals in Zimbabwe. People who go to Zimbabwe travel there mostly for the safaris. And there are a lot of animals you can admire. You must have heard about the Big Five, right? Well, in Zimbabwe, you can watch all of them. You can see lions, leopards, elephants, the aforementioned rhinos, buffalos, and much more. If you take a boat ride, you can even see hippos, although you may not want to get too close. Hippos are peaceful animals, but once you are in their territory, you can expect some defensive tactics.They are all beautiful creatures worth respecting, and it is not like you get to see them that often in their natural habitat. As far as safety goes, you should always check the embassies for threats before you book a flight. That is because there is some political unrest in Zimbabwe, and you do not want to be there when such an event happens. Best case scenario is that you get evaced, but until that happens, you can be in grave danger. Watch for the threat notifications while you are inside the country as well and get out as soon as things start to escalate. Hopefully, that is not necessary. Apart from that, you should always keep your valuable items out of sights. Petty crimes can happen in Zimbabwe, and tourists are usually the victims. Keep your devices (phone, camera, etc.) close to your body, and refrain from wearing jewelry. It is not like you need them there. One of the things that you need to do before you go to Zimbabwe is to get your malaria inoculation. It is a common disease with significant outbreaks in some regions of Zimbabwe, which is why you should get a shot no matter which area you plan to visit. You can contact your doctor and get an appointment. You can also ask about other vaccines that you may need, depending on your personal circumstance. You can pay using credit cards in Zimbabwe, but it is more cash-based, which is why you should bring cash. US dollars are to be preferred so that you do not have trouble exchanging it if need be. At the same time, whenever you go to an ATM, you need to be extra careful with thieves. You should never withdraw too much time at a time. You must have heard a lot of bad things about people in Zimbabwe. There have been some incidents involving residents that originated from other countries. For the sake of full disclosure, bad things do happen in Zimbabwe, and you should always think twice if you should or should not go there. However, at the same time, a lot of people go there without anything terrible happening to them, and they have the best experience of their lives. Evil things that happen in this world should not stop you from living your life and seeing what you want to see. Overall, Zimbabwe is a country worth visiting. You can see a lot of natural wonders, and the animals will leave you in awe. You are pretty safe as long as you follow a few basic rules, and the animals will not lay a single paw/hoof on you as long as you respect them and follow the instructions of your driver or tourist guy. You will have the experience of a lifetime there.